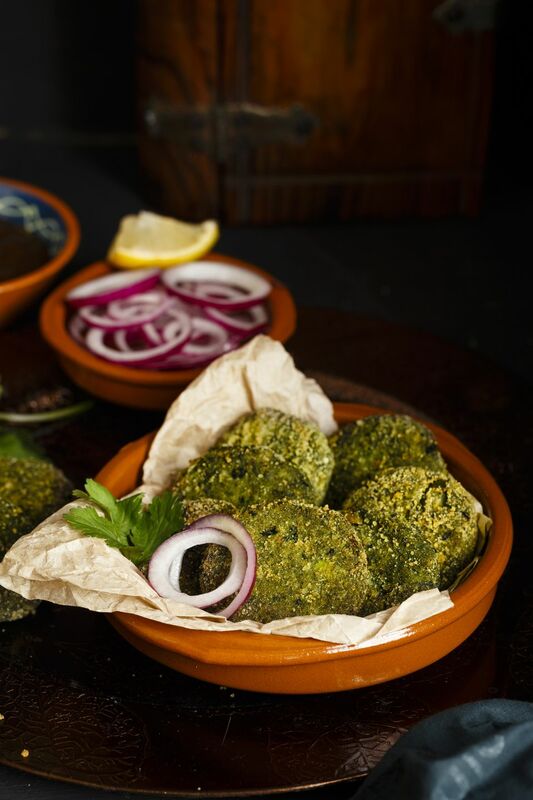 A tasty alternative for those who love kababs but are vegetarian, Hara bhara kabab gets its name and green color from the healthy spinach in it. This is a hara bhara kabab recipe that you may want to try. It's a great way to sneak some veggies into a child's diet, though all ages will enjoy these veggie patties. It's a delightful snack that includes spinach and green peas. You can use fresh or frozen veggies in the patties. Kabab means "to roast". When you are looking for kabab recipes online or in a recipe book, please note that you can spell it kebab or kabab and come up with different combinations. There are different variations of kababs in India such as Bihari, Boti, Dora, Kakori, Tangri, Kastoori and Hariyali. They are usually made with meat. Hara Bhara Kababs are derived from northern India. Some recipes call for maida, but you can use gram flour instead of maida. The addition of gram flour adds a nice flavor and taste to the kebab, and is healthier than traditional kababs. It's just a way to substitute another ingredient into the kababs, which are a vegetarian kabab variation. Other similar recipes that are like hara bhara kababs include rajma kebab, which is a kidney bean patty that can be served with mint raita dip or a mint chutney. Vegetable shammi kebabs are similar but made with lentils and other Indian seasonings. (Some variations include chickpeas instead of lentils beans.) These kebabs do not have the same texture as the hara bhara kabab, but are just as delicious and popular among those who prefer a vegetarian diet or vegetarian meal. Boil the potatoes, peas, and spinach. You may want to drain them well so the excess water does not make the recipe runny. In a bowl, mix and mash together the potatoes, peas, and spinach until they form a smooth paste. Keep the bowl in the refrigerator for one hour. Remove from refrigerator and form into patties. Heat the oil in a heavy-bottomed skillet and shallow-fry the kababs until they are a little crisp on each side. Drain them on paper towels to remove any excess oil. Garnish with cashews and serve hot with a chutney of your choice.